“This person” is of course noise artist Boyd Rice, the controversial former Death in June member whose ties to Nazism, satanism, and accusations of misogyny continue to follow him. Some argue that Rice is just a provocateur using “shock tactics.” What do you think? This is not the first cancellation of this tour. Dates in Toronto and Montreal were also called off for the same reasons. Rice’s inclusion on the Cold Cave tour also enraged Philly ANTIFA folk, where that stop ended up being canceled, resulting in last week’s late night Saint Vitus show. Chicago ANTIFA are none too pleased either, and claimed to have shut down the Empty Bottle show on 6/24 with a smoke bomb (though the show went on as planned). Cold Cave’s upcoming dates with Rice (who performs with the band) include Montreal tonight, and a sold-out Brooklyn show at 285 Kent on 6/28. Don’t have a ticket? 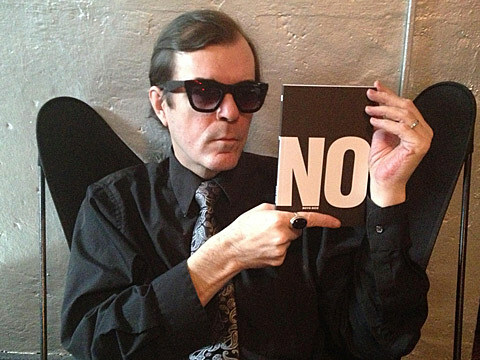 Don’t want to support Boyd Rice, but not holding it against his collaborators? Cold Cave also just announced a September 4th Brooklyn show at Glasslands.